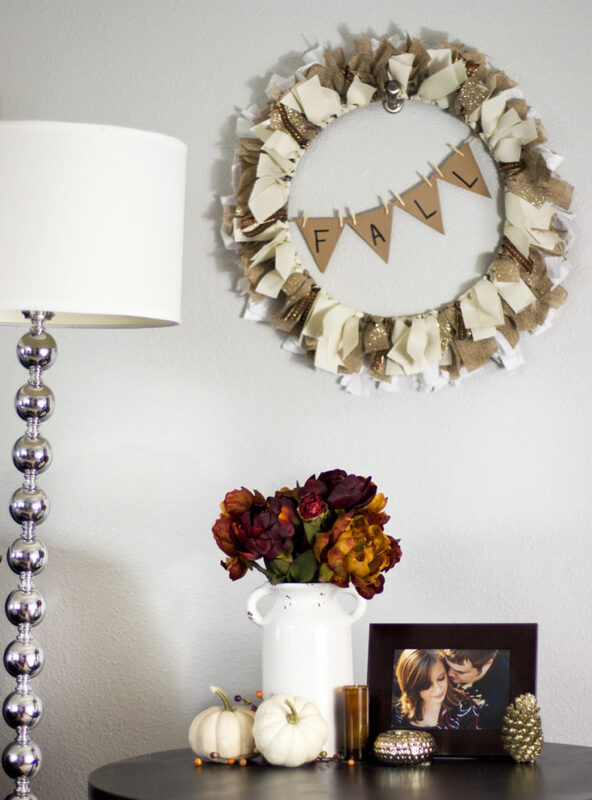 Looking for a pretty yet easy DIY fall wreath idea? I have just the project for you! 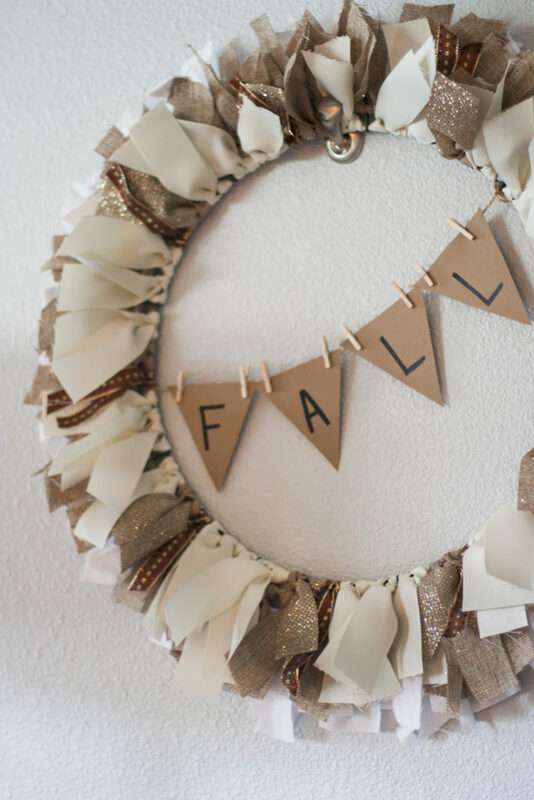 This DIY fall ribbon wreath is super easy to make with limited time and a limited budget. 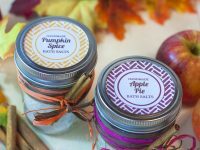 We’ve had a few tastes of cool fall air over the past couple weeks, and that signal of the changing seasons inspires me to decorate our house with simple fall decor. 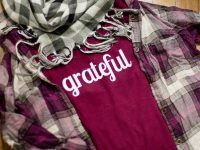 I originally published this DIY fall ribbon wreath on the blog in 2016 and it’s become a reader favorite so I thought I’d share it again today to inspire your fall decorating. If you only add one piece of fall decor to your home, I definitely recommend a wreath. A great seasonal wreath is such an easy way to add a festive touch to your front door and is super easy to change out throughout the year. Sure, you can easily run out to the store and find a gorgeous fall wreath. But have you looked at the price of wreaths lately? 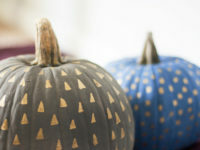 I prefer thrifty decor, especially when it comes to seasonal decor that only gets used a month or two out of the year. That’s why I whipped up my very own DIY fall ribbon wreath! It’s super pretty, fast to make and much less pricey than many of the store-bought options out there. 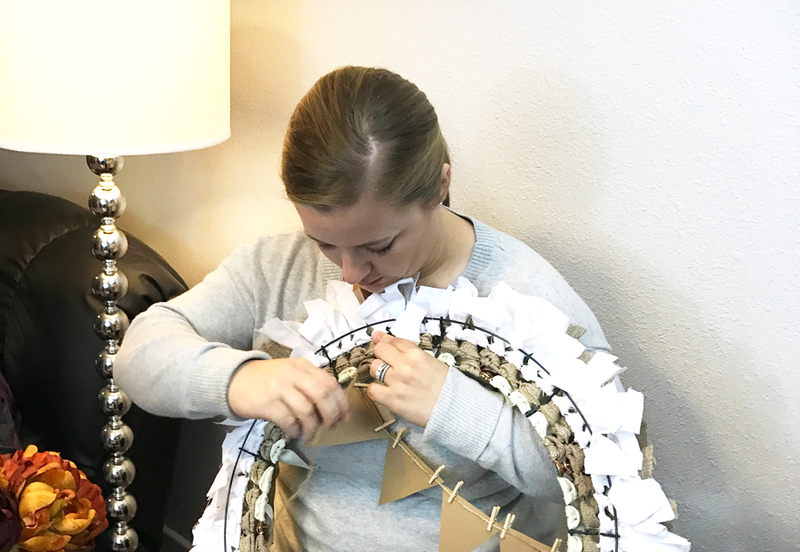 This wreath is easy to create and only requires basic supplies you can find at any craft or department store. WalMart is my only option for supplies in my little town, so it’s always a perk when I can find everything there! 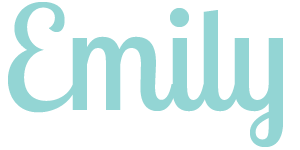 This list contains affiliate links for your convenience. 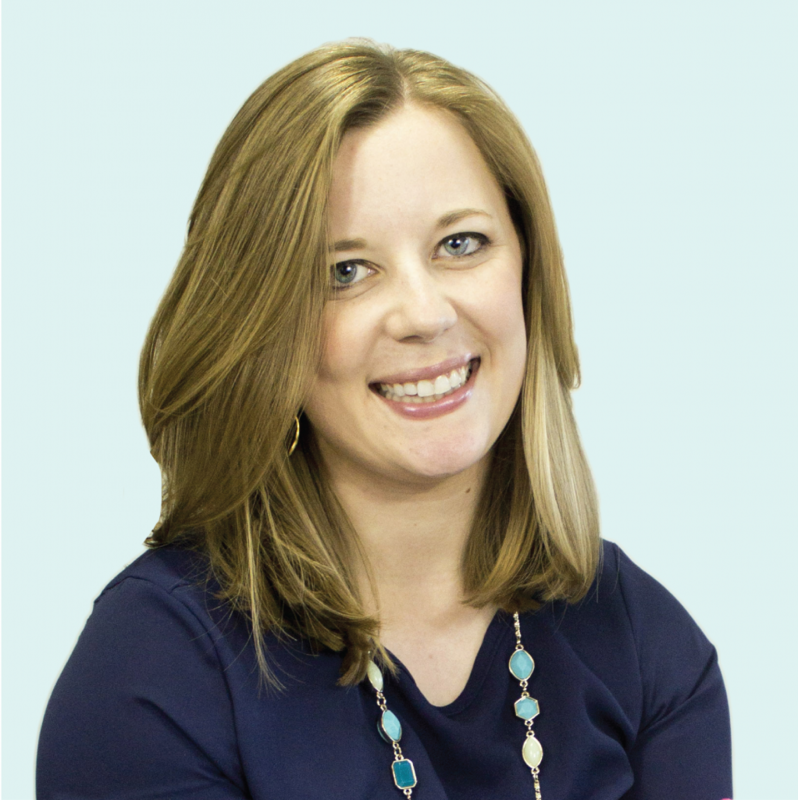 See my disclosures here. First, cut the ribbon into 8-inch long pieces. For my wreath, I used approximately 4 spools of ribbon. The total amount you use will vary, so I recommend using up about half of each roll of ribbon type and see how far that gets you before cutting more. Note: Using a mix of ribbons gives your wreath texture and dimension, so choose ribbons with varying colors and looks. I used a lot of plain cream and burlap ribbon but mixed in a couple sparkly ribbons to jazz things up. Keeping all of the ribbons neutral in color will ensure they look good together! For this ribbon wreath, I also used up some scraps of a cheap white sheet. Any thin white fabric will work for this or you could purchase an extra spool of white ribbon instead. Cut your fabric into 1 x 8-inch strips. Now for the fun part – tying on all of that ribbon! This step is a bit tedious, making it the perfect project to do while catching up on some TV. Note: My wire wreath frame actually has 4 circles of wire, but I opted to leave the outside ring empty. Once I filled the other three circles with ribbon, you’d never notice! This helped cut down on the cost of ribbon. 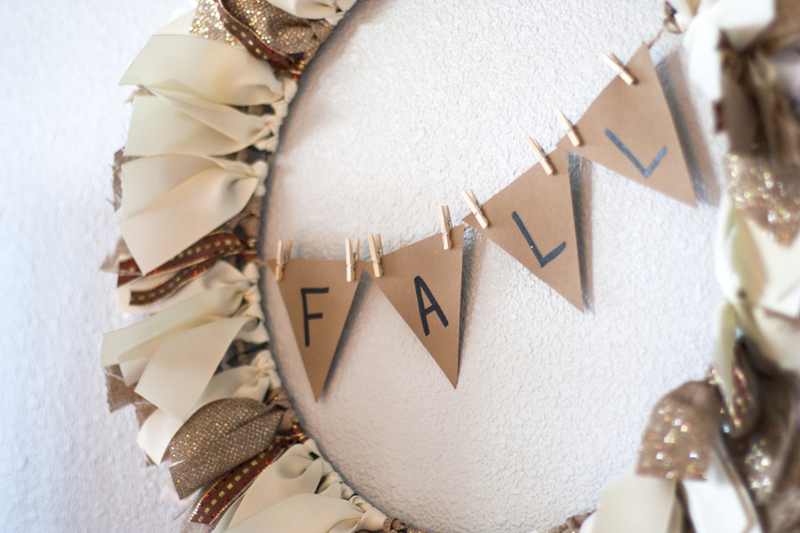 The finishing touch on this DIY fall ribbon wreath is a cute little pennant banner strung across the middle. 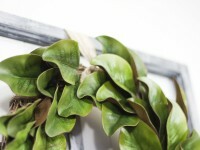 I love wreaths with this detail! Tie a string across the wreath. Use the photo below for reference as to how I placed my string. It’s placed a bit above center on each side and I left it a little loose to create that slight swoop. Cute four little triangles out of cardstock, write F-A-L-L on them, and clip them on the string! Don’t worry too much about making those triangles perfect. Cut one that looks good and use it as a template for the rest. And same goes for the lettering – it’s okay if your handwriting isn’t perfect! Here I am hanging up my pretty new wreath. I made the hubby hold the camera for the last part of the video, and he snuck a few pictures in between takes. He also snuck in several eye rolls as I made him film my hands hanging this on the wall. And here it is hung up above the end table next to our couch. This is the first thing you see when you walk in our front door, so I like to give this spot extra attention when I’m decorating. 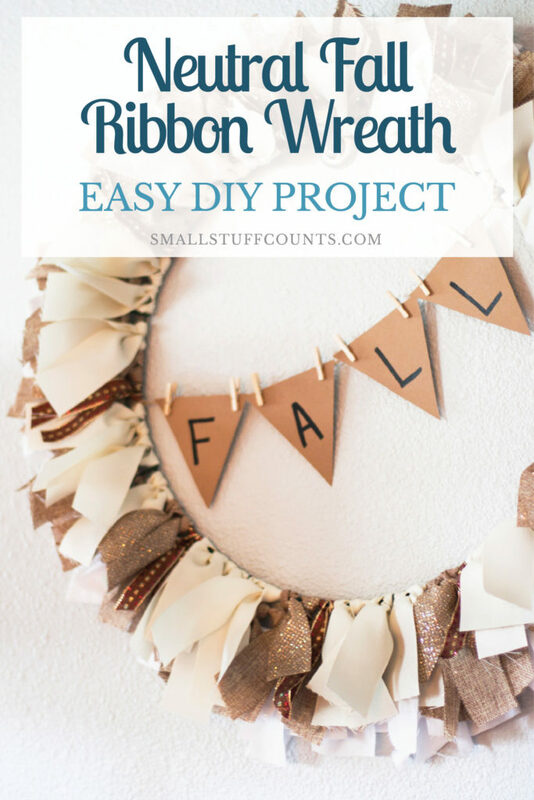 I love the combination of burlap and creams with the subtle sparkle on this DIY fall ribbon wreath. Look at all that neutral, textured goodness. And the simple fall pennant banner is the cutest finishing touch! Want more DIY wreath ideas? Here are a couple more reader favorites! Thank you! I hope you liked this video! My strips of fabric and ribbon were about 4 inches long. Thanks so much! I haven’t done much with video, so it was a new challenge 😉 Thanks for stopping by!